The Open Books store opens this Saturday in Chicago! If you don't know already, I am a marketing intern at this fabulous literacy organization. It's great, but it's definitely different than the corporate world :-) For example, we have to move all our own furniture, which would be a big no-no at either of my old jobs. But, on a positive note, I am no longer doing accounting and am working towards my career goal of getting into marketing for non-profits. So, a very good experience! Anyway, as the store is opening so soon, all of us are spending a great deal of time downstairs shelving books. There are some authors whom I always scan bookshelves in libraries and bookstores for. It usually disappoints me not to see anything by those authors, but if I do- then I feel really, really happy and the bookstore or library goes up significantly in my estimation. One of those authors is Lindsay Davis, though I don't know why as I think I own all Davis' books. Another is Teresa Edgerton, who writes very hard-to-find fantasy novels. Another is Guy Gavriel Kay, who also writes fantasy novels, my favorite being The Lions of Al-Rassan. But the one I most look for is Georgette Heyer, the queen of Regency England. Yes, she writes romance novels, but not the trashy kind. She's so witty. I adore her. Any bookstore that sells her books has the Aarti seal of approval. The Open Books store, therefore, has my stamp of approval. Not only does it carry Heyer, but it has her books in hardcover! Sadly, the most often-found Heyer hardcovers are Lady of Quality, Regency Buck and Charity Girl. These are not on my list of favorite Heyers at all. Regency Buck, in particular, I strongly dislike. Both the hero and the heroine appall me. Appall! I can see why those are the books most often found on used bookstore shelves as, if I had to purge my book collection and somehow needed to decrease my 50+ volume Heyer collection, I'd get rid of those. Anyway, Open Books has Charity Girl and Lady of Quality. BUT ALSO, it has (or had, before I purchased it for myself) a copy of Penhallow! Penhallow is one of Heyer's mystery novels, and not one of the popular ones. It's hard to find in paperback, and even harder to find in hardcover. I've been looking around for it in used bookstores for years. And I found it at Open Books! Here is a picture of a newer issue of the book, published by Arrow. The copy I found is an old edition, by Doubleday :-) I can't even find a picture online to show you, but it has a big, dark blue cover with an English stately home on it. It was clearly published during World War II because the back cover has this big announcement about how buying the book helps literacy and thus helps the world. And the book's back cover also encourages you to BUY WAR BONDS in big, block capital letters. So fabulous! I love a book with a sense of history. I can't even describe how thrilled I was to find this book for myself. And I didn't feel bad about purchasing it as all proceeds from the sale go towards fighting illiteracy in my beloved Chicago. If that's not a win-win situation, I don't know what is. If you're in the Chicago area, come check out Open Books' Grand Opening this weekend! Which authors do you automatically look for on shelves? Any? And do you have a story of a rare find that made you very happy, either in a bookstore or library? This is SO awesome - congratulations on the opening! I am a Chicagoan, and while I can't make the opening, I'll definitely be by soon to check it out and try to find some time to volunteer, too. To answer your question, I always look for Philip Roth, John Irving and Richard Russo. Used bookstores are some of my favorite places in the world - especially when they support such a noble cause! What a great organization to work for! I think I own all Guy Gavriel Kay's books. They are easy to find up here... It's actually READING them that I have a problem with. I want to read Teresa Edgerton. I look for her every time I go to the second hand store! Kelly- If you want to do a read of GGK together this year, I'd be up for it! I plan to reread Lions of Al-Rassan for the Flashback Challenge, anyway. And Teresa is very hard to find, I agree. I will try to mail her to you soon, but the post office hours really don't work with my schedule! That's really cool! Congrats on your great opening! Wow, they have Georgette Heyer? I've loved her regency titles and have recently considered venturing out into her mysteries, too bad you took the only copy! *shakes tiny fist* I really will have to show up and check it out this weekend though. Congratulations on the opening, I look forward to being there! Aside from Georgette Heyer, any books that have to do with the Borderland series, which are out of print, or Francesca Lia Block, again out of print, definitely bring a used book store up a notch or three for me. I'll settle for some Charles deLint or Jane Yolen in a pinch though. Aarti, this is my first visit to your blog. Wow! Very intriguing site! I will look at Open Books. I love the quote on the left about why you read. You are so right, of course. Every book we get has a story about its arrival, and many books become a part of our lives. Some even change us. Hi Aarti: That's an amazing place to intern! I volunteered at Open Books last spring when I was still living in Chicago and it's a fabulous place with an amazing staff. And I always left after working with the kids with the biggest smile. Good luck with your grand opening! Faro's Daughter is my fave Heyer. Nice bookstore! 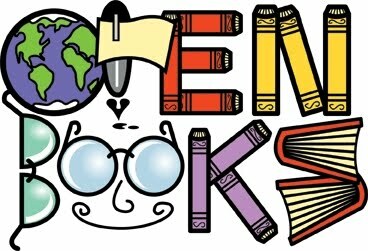 I love the logo for Open Books! Congrats on the opening. And I think you're the tipping point that will get me to read something by Heyer - I've seen several references to her on book blogs recently but now I just may have to take the plunge and try one of her books! There are a few authors I always look for, particularly at used bookstores, like Sarah Waters, even though I already have their books. It's like a sign that I am in 'my kind' of bookstore. Yay! Congratulations on this wonderful milestone for your organization! If I haven't said so already, I really admire the work you are doing and think your internship sounds like a wonderful opportunity for you to learn lots of things about the book world. And it's also great to know that it stocks such pleasing and unusual books. I bet I could spend some serious time and money there! !